First let me start this off by telling you that we will NOT be discussing trends in bridal fashion, color schemes, food, or flowers! We also won’t be talking about honeymoons, tuxedos, or even your wedding invitations. Buckeye Sounds is a DJ company and we really don't know anything about wedding dress or what flowers look good with them LOL. 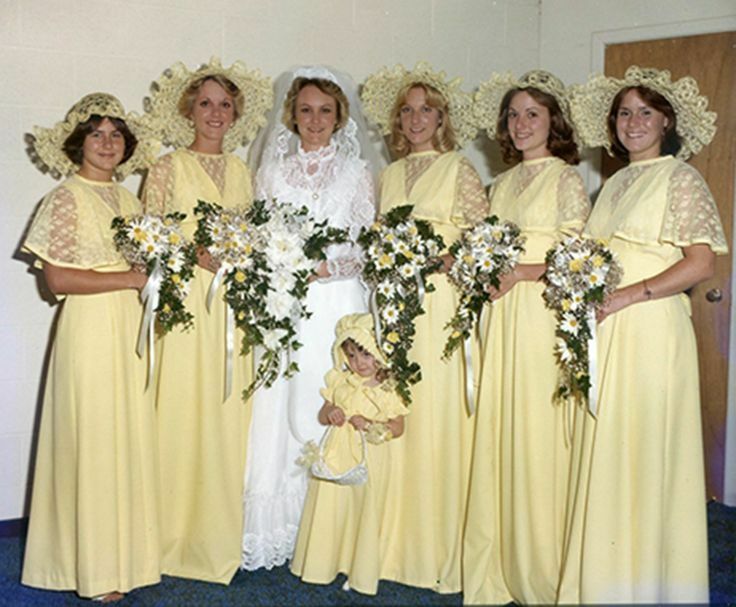 I mean we think this picture of a bride and her yellow dressed bridesmaids looks really current (no…not really). So if you want that sort of information you can easily find it on other sites. What we DO know about, and what we will talk about here, is how to make your reception better. We see multiple receptions almost every weekend of the year. This gives us a front row seat to the best reception’s unique ideas and insights. Its easy to assume that the trends from the past 12 to 18 months will also be popular for the coming year. First and foremost that’s probably the biggest “trend” we are seeing, the lack of trends. During a two month stretch in 2018 I personally DJed three weddings at the same venue (The Westin Columbus) and all three had very different feel, style and look. Now to be totally honest, the music they selected and the colors they choose for the venue might have played a big part of different feel. But one of the things we suggest to every couple we work, and the one thing we hope you get from reading this post, is to feel free to break the mold, do things your own way. I think that’s an awesome thing and I hope it continues! So here goes, here’s our list of New Wedding Trends. We hope that you enjoy this list. Let us know what you think of it. We have this broken down into different sections for the reception, the ceremony, and even a technology section. This is perhaps the most recent trend that we’ve noticed. This one sort of surprised us, but it is something that we noticed this year in a big way. It seems that couples are really wanting to push the dancing, but don't want us to play too many slow songs. We even had a few receptions where the ONLY slow songs they wanted were for the special dances. Yeah I know we started this post by saying that we were not going to discuss food trends but this one has become so popular I felt the need. Bringing out a late night snack is HOT! Pizza seemed to be a very popular choice in 2018. But whether it’s donuts or egg and cheese sandwiches in the lobby for your guests to grab on the way out, we are seeing this at so many weddings. It’s a great final send-off for your guests (even if pizza at 11PM isn’t the healthiest thing to eat that late at night). Speaking of color themes, decor lighting is almost a must nowadays at weddings. The obvious reason is that it brings the color theme of your wedding into your venue. It can be surprising how a little bit of color can go a long way here. And here’s something you probably don’t know, but decor lighting makes for GREAT pictures, not just of the details, but also when people are on the dance floor. The latest decor lighting fixtures are battery powered (so they can be place anywhere in the room) and controlled remotely. It’s just another way to put your personal stamp on your day. Speaking of the bar, the next trend we see often now is the signature cocktail. Couples are creating their own drink, naming it after themselves or something to do with their wedding, and displaying it prominently at their bar. I’ve spoken to some bartenders about this and they love the trend, as long as the drink doesn’t require like fifteen steps to make. If there’s a blender involved along with crushed mint leaves, three minutes of shaking and four straws and an umbrella, the line is going to get long at the bar. But Signature Cocktails are an awesome way to put a personal spin on a reception and I often see them matching the color theme of the wedding. The main reason we’re aware of this trend is that we ask all the couples we work with about their honeymoon and then often mention it late in the reception. On the microphone I might say something like “they’re going to Hawaii!” and that often gets a big reaction. But we’ve worked with a lot of couples recently who either weren’t taking a big trip at all or were waiting a while before they went away. The significance of a honeymoon has obviously changed through the years so it’s understandable. Of course a lot of planning is done online and especially with social media - with Instagram and Pinterest leading the way. But as you plan your big day, if you start thinking about not getting on a plane immediately after, just know you’re not alone. There are plenty of couples who aren’t traveling right away or have already taken their “dream vacation” before the wedding. Finally the all-inclusive resorts seem to be the most popular destination, especially for Mexican and Caribbean honeymoons. For the longest time we’ve been seeing receptions with an average of 150 guests. But just recently, we are starting to see that number slowly creep up. Now our average seems to be 200 guests. The really large wedding receptions of 300+ guests seems to happen more often now too. Recently we had a reception in Cincinnati with over 400 people attending! Why is this becoming a new trend? While the economy improving has something to do with this, but we think its just today’s couples want to include more people in their celebration. So we love this. Maybe this is just because our receptions are getting bigger, but we are starting to see more people in the wedding party. It used to be 3 or 4 people per side. Now its not unusual to have 6 or more people per side. This also makes for some unique introductions. Is it an exaggeration to say that Instagram has changed weddings? Now that every event on the path to getting married is up for documentation—the proposal, the engagement party, the bridal shower, even the cake tasting - today’s couples are looking to display them at a reception. The best way to do this is video screens, and while we usually place in the reception area, you can place them in the cocktail area too. So you can have baby pictures of the bride and groom. Pictures of their early dating. And we had a reception where we showed the picture that we taken a few hours ago by the photographer. One of our favorite things to do is to display pictures off of Instagram that are using the wedding hashtag. Or we can show pictures from our photo booth! Multi-media simply offers a fresh approach that isn’t completely over done….yet. Another sign that couples are trying to personalize things as much as possible is the trend of selecting a separate song for each couple (or even each individual) in their bridal party to be introduced to. Most DJ companies you consider with will be happy to work with you on this. The key is playing the best part of the song (usually the chorus) as the couple or person is introduced. This is a trend we started seeing a few years ago and it only continues. Some couples want their first dance to be a mashup of a few songs, usually going from a traditional slow song into something upbeat and fun. Any entertainment company you work with should be able to make a mix like that for you and get it to you early enough so you can rehearse it and make it a fun moment. There have been a handful of couples who have “gone viral” when videos like this make their way to Youtube so if that’s your ultimate goal, good luck! You may just be the next online sensation. More and more we are seeing couples ask a friend or family member to officiate their wedding. It is so easy nowadays to get “ordained” online (which then gives you the legal right to marry a couple) and a first-time officiant can easily research how to put together a script for a ceremony with one Google search so I believe this trend will only continue and become even more prevalent. My advice to couples is to pick someone who has a little public speaking experience because I have witnessed a few first-time officiants fold under the pressure. And my advice to new officiants is stay away from the bar till after the ceremony is over. No longer to walk down the aisle to the traditional “Here Comes The Bride”, couples today are selecting a WIDE range of music for their ceremony. Popular songs of all eras are now being played. You can find some really great versions of current songs played on a piano or violines in Youtube, such as the Piano Guys. Songs for the recessional are now more fun and seem to be focused on ‘finally finding the perfect person to share their lives with’. First looks have become such a huge and accepted trend that its hard to even call them a trend at this point. It’s almost become the new tradition. There are several advantages to having a first look, some of which have NOTHING to do with your reception. First off, you can get some really great pictures like the one we have here. We’ve seen a first look pictures that we just love the look on the couple’s faces. Second, we think its just a great moment for the couple alone to share. Lets face it, most of your wedding day is spent with many other people - your family and friends - and it should be that way. But ‘stealing away’ for a few minutes with just you two (and your photographer and videographer LOL) might end up being your favorite memory of the entire day. And we promise that your ceremony will still be emotional! Finally, you can take all your pictures and not miss your entire cocktail hour. This allows you some more time to spend with your guests. Sure tradition says the bride and groom shouldn’t see each other before the ceremony but how many other traditions have we already put aside? Brides and grooms want to see all the photos and videos captured on their day. That goes for the images that were taken professionally as well as all the shots that were taken by their friends and family members. Using a personalized hashtag is a great way to find all those posts on Instagram and Facebook. The key is create a unique hashtag. For example, if you use #OurWedding, your picture will just be a small drop in the bucket compared to the other 100,000 pictures on Instragram (I checked). Your pictures will totally get lost in the mix. 1) Use your names and wedding date or something clever that ties into your day (for example: one of my couples last year were April and Richard and their hashtag was #AprilGetsRich) but then you have to get the word out to your guests. 2) Create the hashtag early enough you should include it on your wedding invitation, wedding website, etc. 3) Encourage your guests to use it even prior to your wedding day. This way, when you search that hashtag, you might even find shots of your bridal shower or bachelorette party (appropriate ones of course!) and it can become a whole documentation of everything leading up to and including your wedding day. Geofilters are special overlays that communicate the “where and when” of a post on Snapchat and many couples are creating them to use at their wedding. Because you create a small filer that only covers your reception area, they are inexpensive and fun to use. This will be a huge hit with rour younger, social-media savvy guests. You don’t need to have any graphic design skills either as you can easily buy very nice looking versions online and then make a few simple tweaks to make them unique for your reception. The Huffington post did an article this year entitled “5 Signs You’re At a Millennial Wedding” and they discussed these trends as well. 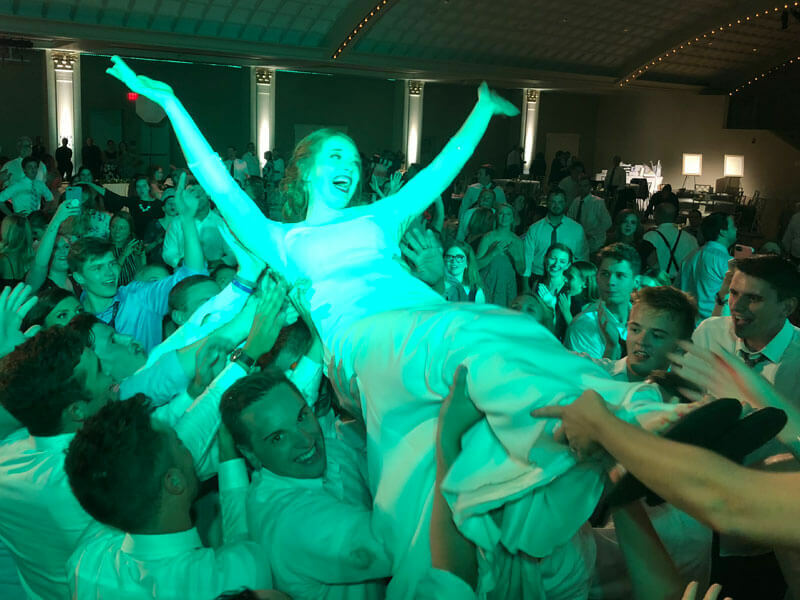 Take a minute to remember your High School physics / science class where you learned that it was Isaac Newton who theorized “for every action there is an equal and opposite reaction.” Just as there is a trend to use hashtags and encourage guests to post everything they capture to social media, there is an opposite trend towards unplugged weddings. If you decide to go this route, where you ask your guests to refrain from cell phone use and “be in the moment” at your wedding, there are a number of different ways to convey this to your guests. It can be included on your invitation (with polite wording to the effect of “we’ve hired professional photographers so please refrain from taking pictures at our wedding. In fact, we’d love to see your face all day so if you could stay off your phone completely it would mean the world to us”) and reminders can be placed around your reception (another Huffington post article offered some great suggestions for this). It’s something we could all probably focus on more and more so if you chose to go this route with your wedding, more power to you! It’s been amazing to witness the evolution of photo booths in the last decade. I can clearly remember the first few times I had one at a wedding I would have to get on the microphone and explain to all the guests what that big box was over in the corner of the room. It was a new thing and no one expected them. Since then they’ve become so ubiquitous some guests actually walk into the reception and look for the photo booth. There seems to be two trends in photo booths. 1) Social media booths where your guests can immediately post their pictures onto their favorite sites. 2) We are seeing more and more VERY basic photo booths that consist of nothing more than a backdrop, some props and the wedding hashtag to use when you post your photos. Personally I still think a traditional photo booth that prints out a strip of pictures is better but that also might be a generational thing. For many millennials they don’t care about a printed picture nearly as much as they care about a cool post on social media. WARNING - SHAMELESS PLUG COMING UP! We are also excited for our new mobile Photo Roamer booth which allows us to take pictures anywhere during a reception instead of being locked in the corner of the ballroom. So those are the trends we’ve seen and predict will continue. One of the things we know to be constant though is that everyone wants to have a great time at their reception. Celebrations are made memorable when everyone from the guests of honor to all the invited guests has fun. And that can mean different things for different people. Some people define a fun party by how much they danced, some by how good the food was. Still others just want to catch up with loved ones they haven’t seen in a while. So creating an environment where all those things (and more) can happen will always be the key to success at any wedding.